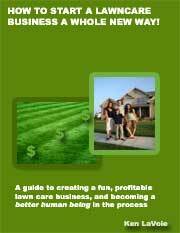 How to price a lawn mowing job by Ken LaVoie: Lawn care pricing guide. I have included more material here than many other services because it's the lion's share of our business. 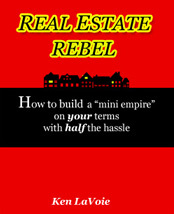 I've included pricing, strategy and some other tips. I price mowing at $1 a minute per man. Very simple, so we can estimate a lawn quickly, on the fly, without pulling out a calculator. This rate gives me $60 per man hour which is what I have decided to charge for my mowing services, based on my internal costs as well as my desired profit. I use a mix of methods to estimate each lawn. We work in rural Maine, and every yard is a little different. We don't have alot of "postage stamp" yards that we can apply a formula to. I start with a $30 minimum if we can do the whole lawn with a commercial walk-behind or zero-turn mower, $50 if we have to even THINK about breaking out a rear-bagging push mower. From there, I take an educated guess as to how long the job will take based on "comparing" it to other lawns we have. In other words, if I have a similar lawn across town that I charge $30 for, but this one has 5 extra trees and a fence, I might charge $33-$35 per mowing. Now if you don't HAVE any other lawns yet, this method won't help. So here's a quick bullet list of times based on size of lawn. 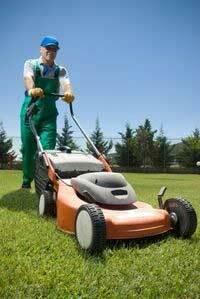 We mow weekly: If the client wants it every ten days or bi-weekly, we then charge by the hour or say goodbye. Mowing a lawn in May that's grown 6-7 days is an entirely different job than mowing one that's had 10 or more days to grow. Waiting 2 days can double your time requirement. This is a great reason in and of itself to take on only what you can stay caught up on. Being buried with mowing work is a vicious circle. You end up working twice as many hours and earning half the hourly rate of the guy who paced himself. Follow these guidelines, and you won't get in MUCH trouble, and you can tweak this system as you go. I STRONGLY recommend that you put a clause in your agreements stating that you can increase mowing price with 30 day notice. Finishing a "one time" job that you under-bid is one thing. Showing up week after week to mow a lawn for $25 that you should be getting $40 for is quite another, and I don't personally believe you should be locked into that. 30 days is plenty of time for them to decide to keep you or find someone else. travel (5-10 minutes - any more and you need to question whether the account is worth doing) TIMES hourly rate equals mowing price. 75% efficiency rating is representative of actual mowing conditions, as it allows for turns and overlapping. Formula for calculating acres per hour: % efficiency = (mph x width of cut)/99. I personally think it's a good idea to do ALL your lawns at LEAST once or twice by YOURSELF so that you have an idea of how long mowing vs. trimming and blowing should take. You might record both mowing and trimming time on all-or most of-your lawns just once, so you have a ballpark. It's good to really be clear how long things should take so you can properly assess how your helper-or entire crew-is doing time- and efficiency-wise.